As had been reported this past April, Bird & Beckett Books and Records has been supporting jazz bassist Lisa Mezzacappa by providing her with a five-concert residency. The residency involves a project to develop a new suite based on stories by Italo Calvino that were originally published in Italian periodicals in the early Sixties and subsequently collected under the title Cosmicomics. Over the course of his relatively short life (he died of a cerebral hemorrhage at the age of 61), Calvino explored an imaginatively broad diversity of approaches to writing, ranging from collecting Italian folk tales, to writing fiction about other literature, and even writing fiction about reading. 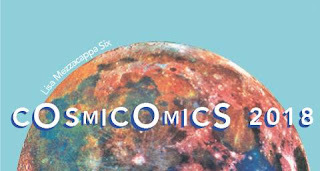 In the Cosmicomics stories he uses fiction to explore scientific theories with a knack for finding sources of humor in what the “professionals” take seriously. The first four of Mezzacappa’s concerts are actually Work-in-Progress Salons. Last night Bird & Beckett hosted the third of them, and I finally had an opportunity to drop in and see how Mezzacappa’s project was progressing. All of the Cosmicomics pieces she is creating are being scored for a sextet that she leads, whose other members are Aaron Bennet (tenor saxophone), John Finkbeiner (guitar), Mark Clifford (vibraphone), Tim Perkis (electronics), and Jordan Glenn (drums). Last night’s program consisted of six pieces based on Calvino’s stories, along with a performance of “Army Street,” a piece she composed as part of a past project based on the film noir genre, which she called avantNOIR. She introduced each of the pieces with a brief plot summary and occasional quotes from English translations of Calvino’s texts. On some occasions she would suggest how the structure of the narrative would be reflected in the structure of the music. However, if Calvino’s tales amounted to idiosyncratic meditations on scientific profundities, one could describe last night’s performances as idiosyncratic mediations on Calvino’s meditations. Given his own writing about both writing and reading, Calvino probably would have appreciated Mezzacappa’s recursive stance! Mezzacappa also shares with Calvino an intense attention to intricate detail, almost as if both of them are playfully trying to seek out the devil that lurks in those details. Indeed, many of the rhythmic patterns can only be described as devilishly eccentric, making it more than a little impressive when those passages are played in unison by three of the members of the sextet. However, the intense precision of such passages does not entirely eliminate opportunities for improvisation; and each member of the group had an opportunity to flex his/her improvisational chops. Nevertheless, there was one particular member who seems to have been specifically chosen to embody Calvino’s playfully warped reflections on cosmic insights. That was Perkis, who has almost uncanny gifts for improvising with just about any kind of synthesis gear, analog or digital. As I have previously observed, even when Perkis is working in the digital domain, his controls are analog, often involving minuscule movements of knobs or sliders. Last night the results were some uncanny punctuations of the jamming by the rest of the group, achieved through little more than wailing sinusoids. The other five members of the group may have been presenting Calvino’s characters and narratives; but Perkis was there to establish the “cosmic” environment.